Born in San Francisco, Breed was raised by her grandmother in Plaza East public housing in the Western Addition neighborhood of the city. Breed later wrote of her childhood in San Francisco: "[F]ive of us liv[ed] on $900 per month. 'Recycling' meant drinking out of old mayonnaise jars. Violence was never far away. And once a week, we took Grandma's pushcart to the community room to collect government-issued groceries." Her younger sister died of a drug overdose and her brother is in prison serving a 44-year sentence for which Breed has repeatedly asked for clemency from the governor's office. Breed graduated with honors from Galileo High School. She earned a bachelor's degree from the University of California, Davis in 1997 and a master's degree in public administration from the University of San Francisco in 2012. Breed worked as an intern in the Office of Housing and Neighborhood Services for Mayor Willie Brown. In 2002, she became the executive director of the African American Art & Culture Complex, where she raised over $2.5 million to renovate the complex's 34,000 square foot space, including an art gallery, theater space, and a recording studio. Breed was named to the San Francisco Redevelopment Agency Commission in 2004. In 2010, Mayor Gavin Newsom appointed her to the San Francisco Fire Commission. Breed was inaugurated as District 5 supervisor on January 8, 2013, with then-California Attorney General Kamala Harris administering the oath of office. On January 8, 2015, Breed was elected President of the San Francisco Board of Supervisors first by a vote of 8 to 3 and then unanimously. She defeated supervisor David Campos, who was also nominated for the position. Breed succeeded District Four Supervisor Katy Tang, who assumed the presidency temporarily after then-Board President David Chiu resigned to begin serving in the California Assembly. As part of an FBI investigation into public corruption and bid-fixing primarily involving then-State Senator Leland Yee, businessman Derf Butler was recorded talking about allegedly paying for access to Breed. According to court documents released in 2015, Butler told an FBI source that he "pays Supervisor Breed with untraceable debit cards for clothing and trips in exchange for advantages on contracts in San Francisco." The allegation was denied by Breed, who as a member of the Board of Supervisors had no role in contract selections, and no evidence has ever been presented to substantiate it. In February 2016, Breed announced her reelection bid to represent District 5. The top issues she identified in her announcement were building and protecting affordable housing, increasing public safety, improving environmental health, and modernizing public transportation. Dean Preston, an attorney, ran against her. Breed won reelection 52% to 48% on November 8, 2016, beating Preston in 46 of the district's 68 precincts. Breed was unanimously reelected to another two-year term as Board President on January 9, 2017. No other supervisors were nominated for the position. Following the death of Mayor Ed Lee on December 12, 2017, Breed became the city's Acting Mayor by virtue of her position as President of the Board of Supervisors. She served in this position until January 23, 2018, when the Board of Supervisors selected Mark Farrell to serve as interim mayor until a special election on June 5. Supervisors Aaron Peskin, Jane Kim (herself a candidate for Mayor), and others considered the progressive members of the board, sought to deny Breed the benefits of incumbency going into the election. Progressive Supervisor Hillary Ronen, former Chief of Staff to Breed's erstwhile opponent for the Board of Supervisors presidency David Campos, delivered a tearful speech accusing Breed of being supported by "white, rich men" and "billionaires" such as Ron Conway. Ironically, the Supervisors' choice, Mark Farrell, was a white male venture capitalist whose firm Conway had invested in. Breed ran in the mayoral special election held on June 5. She led in the initial count's first-place votes with 35.6 percent, with Mark Leno in second with 25.9 percent, and Kim with 22.8 percent. Leno took the lead early the next day after the initial tabulation of ranked-choice ballots, but Breed retook the lead on June 9. On June 13, with only 8,000 ballots left to count, Leno conceded defeat and congratulated Breed on her victory. Breed resigned as president of the Board of Supervisors on June 26, 2018, and was succeeded by Malia Cohen in a unanimous vote by the Board. Breed retained her position as District 5 supervisor until assuming the mayoralty on July 11. Breed has declared her intention to run for a full term in the next regular mayoral election, to be held on November 5, 2019. As mayor, Breed took several unannounced walks through different neighborhoods of the city. She created a task force of members of the San Francisco Department of Public Works to clean up feces from city sidewalks, known as a Poop Patrol. Breed made homelessness an early focus of her administration. In October, she announced plans to build 1,000 shelter beds by 2020. To help achieve this goal, she introduced legislation declaring a shelter crisis in San Francisco, which allows the city to waive certain permitting and contracting requirements for homeless services. She also has worked to expand mental health and substance abuse recovery beds. When the Controller found an extra $415 million in property taxes, Breed introduced legislation to fund housing and homelessness programs with the discretionary portion of the funding. She also authored legislation with Supervisor Rafael Mandelman to expand San Francisco’s conservatorship laws, based on California Senate Bill 1045, authored by State Senator Scott Wiener. Breed authored legislation in 2014 to allow the San Francisco City Attorney to pursue civil damages against graffiti taggers, instead of solely relying on criminal prosecutions to punish taggers. In 2016, City Attorney Dennis Herrera used these new penalties to win a civil judgment against serial tagger Terry Cozy that resulted in a $217,831.64 fine. The San Francisco Fire Department's response times to emergency medical calls spiked dramatically in 2014, with ambulances often unavailable to respond. Breed was outspoken in demanding improvements, pushing then-Mayor Lee to do more, expressing a lack of confidence in Fire Chief Joanne Hayes-White, and generating press attention for the issue. Breed fought for substantially more funding for emergency medical services, ultimately succeeding in getting $47.3 million invested to hire EMTs, paramedics, firefighters, and 911 dispatchers, as well as buy new ambulances and fire trucks, and improve SFFD facilities. Breed has cited her work on this issue as helping to reduce ambulance response times by over 26%. Her work also helped her earn the sole endorsement of the San Francisco Firefighters Local 798 union in the 2018 mayoral election. In 2015 Breed worked with then-Mayor Ed Lee to help add 400 new police officers to the San Francisco Police Department and outfit every officer with body cameras. She also cast the deciding vote in favor of then-Supervisor Scott Wiener's legislation to increase police staffing levels as the city's population grows. After the shooting of Mario Woods by San Francisco police officers on December 2, 2015, Breed and Supervisor Malia Cohen passed a Resolution calling for a federal investigation of the shooting and a Department of Justice review of the SFPD’s use of force policies. This ultimately resulted in 272 recommendations to improve the SFPD. Also in 2015, Breed led the effort to stop a proposed $380 million new jail for San Francisco, saying: “I’ve seen way too many people from my community, friends, even family members, end up on the wrong side of these iron bars,” and calling the jail proposal “a return to an era of mass incarceration, an era San Francisco is trying to leave behind.” She created a working group to develop an alternative to the jail proposal including "new mental health facilities and current jail retrofits needed to uphold public safety and better serve at-risk individuals." In 2016 Breed again partnered with Cohen to pass two ballot measures regarding the police department, one requiring investigations of all officer-involved shootings and one reforming the Department of Police Accountability. Both passed overwhelmingly. Breed also worked with then-Mayor Lee to pass a $350 million Public Health and Safety Bond in 2016, which funded $272 million in improvements for fire and healthcare facilities, $58 million for a new ambulance center, and $20 million for homeless shelters. In 2017 Breed passed legislation to prevent car break-ins in tourist hot spots and commercial corridors by requiring rental car companies to inform their customers of the risks. As a candidate for mayor in 2018, Breed often cited her own tenuous housing story. "I grew up in Plaza East public housing in the Western Addition," she wrote. "Housing insecurity isn’t just an abstract point of policy for me. I’ve lived it. When I was in college, we were told our home was being torn down...I have seen generations of my family, friends, and classmates leave San Francisco. Today, my housing situation is like many living in San Francisco. My home is a rent-controlled apartment...Until two months ago I still had a roommate. I’m still paying off my student loans. I drive a sixteen-year-old car and bring coupons to the store. San Francisco is experiencing an affordability crisis, and I’m right there with you." As Supervisor in 2014 Breed secured $2 million to renovate unused public housing units for formerly homeless families. In 2015 Breed helped pass "neighborhood preference" legislation to prioritize neighborhood residents for the affordable homes built in their community. When the federal Department of Housing and Urban Development threatened to block the legislation, Breed flew to Washington D.C. with a delegation of San Francisco officials and persuaded it to let the program proceed. The program first went into effect for the Willie B. Kennedy apartments in Breed's district, with 39 units prioritized for community residents at risk of economic displacement. Breed also passed legislation in 2015 to create Neighborhood Commercial Transit District in the Divisadero and Fillmore corridors in her district. The laws removed housing density caps, allowing more homes to be built on a given parcel without increasing the size or height of the building. Both passed unanimously. Her reelection opponent, who consistently opposes new housing, demanded that she rescind the law, but Breed refused, citing the need for more homes in the city. Also in 2015, Breed passed legislation to remove minimum parking space requirements for new buildings and allow unused parking spaces in existing buildings to be converted housing. Breed was the lead sponsor and co-sponsor of two housing ballot measures: Proposition A in 2015, a $310 million bond for affordable housing which passed with 74% support, and Proposition C in 2016, a $261 million housing bond that repurposed unused city bond funds for affordable housing and passed with 77% support. Breed joined Supervisor Ahsha Safai in supporting the 2018 "Housing for All" ballot measure, Proposition D, to increase the city's tax on commercial rents to "raise about $100 million a year to pay for 10,000 low- and middle-income housing units and shelter accommodations for the city’s homeless population over the next decade." After facing a competing tax increase measure, Prop D did not pass. In 2017 Breed coauthored legislation to provide civil counsel for tenants facing eviction, reducing the chances of vulnerable tenants unfairly losing losing their homes. Voters approved a similar measure in June 2018, Proposition F.
Breed is a major advocate for modular housing, arguing that it can be built more quickly and cheaply than conventional construction, helping the city create more housing sooner. As Acting Mayor she announced a partnership with labor unions to build a modular housing factory in or near San Francisco. Breed carried multiple pieces of legislation allowing Muni to purchase hundreds of new buses and replace its entire fleet of trains. Introduced over several years, her legislation provided for 50 hybrid buses, 260 light rail vehicles, 61 hybrid buses, 60 trolley buses, 98 hybrid buses, 33 trolley buses. The 260 new light rail vehicles are slated to replace Muni's aging fleet of Breda trains, add 24 trains for the new Central Subway, and provide 85 more trains for added service throughout the system. Built by Siemens in Sacramento, the new trains are lighter and quieter than the ones they replace and project to run almost 12 times longer before needing major repair. The first Siemens train went into service in San Francisco in 2017. As Supervisor Breed focused much attention on the N Judah Muni train line, which runs through District 5 and is the busiest Muni line in the city. She worked with Muni to launch a morning commute shuttle train, serving the most crowded stops from Cole Valley to Downtown. Breed worked with then-Supervisor Scott Wiener in 2013 to persuade Muni to change the seat layout in its trains from forward-facing to side-facing to create additional room for passengers. Muni initially refused to test the idea, so the Supervisors called a public hearing. Muni eventually agreed, testing the change on several trains. Riders preferred this design according to Muni's surveys, and Muni incorporated it into their new train designs. Breed worked with the San Francisco Municipal Transportation Agency and Bay Area Rapid Transit and carried the legislation to add cellular service for riders on Muni's underground trains. The lack of cell service has been a long-standing complaint by riders. Breed's plan did not require any city money and may generate funds for the SFMTA. Breed cosponsored 2014's Proposition A, a $500 million bond to fund street repaving, infrastructure repair, transit service improvements, and increased bicycle and pedestrian safety. It passed with 72% support. She was also the deciding vote to place 2014’s Proposition B on the ballot, which required transportation funding to be increased with population growth. It passed with 61% support and now provides approximately $25 million per year for transit, bike, and pedestrian improvements. When Kezar Drive, a major thoroughfare in her district, fell into disrepair, Breed addressed what she called a "case study in bureaucracy" between the Department of Public Works and Recreation and Parks Department and got the road repaved. In 2015 Breed coauthored legislation to create San Francisco's Transportation Sustainability Fee (TSF), requiring residential developers to pay a fee toward transportation improvements. The legislation is generating approximately $14 million annually in new funds for Muni and other transportation projects. Breed also worked with Mayor Lee to add $48.1 million in funding in the San Francisco Municipal Transportation Agency Fiscal Year 2015-16 budget for "service increases, new capital investments, purchase of buses and trains, and bicycle and pedestrian safety enhancements." Also in 2015 she helped approve and secure funding for the Van Ness Bus Rapid Transit project, which is making infrastructure repairs and safety improvements to the Van Ness corridor and is projected to cut transit travel times by up to 32%. In 2017 Breed called for a hearing at the Board of Supervisors after the Municipal Transportation Agency disclosed that it had only spent 2% of the $500 million in bonds that voters had approved for transportation improvements more than two years earlier in 2014. Breed argued that delays at the SFMTA mean "our money grew less valuable and our transportation projects more delayed." Breed carried the legislation to place Regional Measure 3 on the San Francisco ballot in June 2018. The measure passed and "will be used to finance a $4.45 billion slate of highway and transit improvements." including BART, Muni, and Caltrain. During her first few months as Supervisor in 2013, Breed persuaded city departments to complete two new bike lanes on Oak and Fell Streets ahead of schedule, prompting the local transportation site StreetsblogSF to say she had “emerged as a bicycling champion.” She secured federal funding for the redesign of Masonic Boulevard in her district, which added bike lanes and traffic safety measures to one of the most dangerous corridors in the city. The official ribbon-cutting for the completed "Masonic Avenue Streetscape Improvement Project...between Geary Boulevard and the Panhandle" took place in August 2018. Breed cosponsored the 2014 legislation to implement Vision Zero, a plan to eliminate all traffic fatalities via improved engineering, education, and enforcement. She also cosponsored the 2016 legislation to create the city's Transportation Demand Management (TDM) Program, in which housing developers provide transit benefits to their residents such as transit passes, bike parking, and carpool programs. When the SFPD began ticketing bicyclists for not completely stopping at stop signs in 2015, Breed became the first elected official in San Francisco to support the “Idaho Stop” law, which allows bicyclists to yield at stop signs instead coming to a complete stop. A group of bicyclists protested the SFPD enforcement by completely stopping at all stop signs, a demonstration that "snarled traffic" and was "flanked by an army of TV cameras and amused onlookers." Breed and former Supervisor John Avalos wrote legislation to enact the Idaho Stop law, which passed the Board of Supervisors but was vetoed by Mayor Lee. Breed also passed legislation in 2015 banning certain obstructions to bike lanes and removing parking minimums in new buildings. A street construction project on Haight Street in Breed's district caused multiple safety issues in 2015 when Synergy Project Management, a subcontractor working under the General contractor Ghilotti Bros., repeatedly hit underground gas lines. Breed had work on the project stopped and called a hearing at the Board of Supervisors about the matter. She later passed legislation with then-Supervisor Scott Wiener to revise the city's contract awarding process, emphasizing a bidder's past safety record. Breed's best-known environmental work is likely her successful fight to launch the city's clean electrical energy program, CleanPowerSF, a Community Choice Aggregation program in which San Francisco purchases renewable, greenhouse-gas-free electrical energy and makes it available to San Francisco ratepayers. Its ultimate goal is to achieve 100% clean electrical energy in the city. According to the San Francisco Department of the Environment's Climate Action Strategy: "Moving to 100% renewable electricity is the single biggest step the City can take to reduce GHG [Greenhouse Gas] emissions. The potential GHG emissions reduction from this program is estimated to total 941,000 metric tons (mT) of CO2e annually by 2030." When Breed took office in 2013 CleanPowerSF had, according to the San Francisco League of Conservation Voters, "languished for 12 years" in the face of opposition from multiple mayoral administrations, the city's utility provider PG&E, and other business interests. "Breed took it upon herself to get CleanPowerSF off the ground," said the League of Conservation Voters. Under the city's charter, the San Francisco Public Utilities Commission had ultimate authority to approve or reject the program. When they rejected proposed power rates for the program in August 2013, Breed authored a resolution at the Board of Supervisors, arguing: "In failing to set not-to-exceed rates for CleanPowerSF, the Public Utilities Commission is contradicting the policy directives of the Board of Supervisors...The Board of Supervisors refuses to acquiesce its policymaking authority to the Executive bureaucracy; and... If the Public Utilities Commissioners fail to set not-to-exceed rates, or hereafter fail in any way to timely implement CleanPowerSF, the Board of Supervisors shall, whether at the Board Chamber or the ballot, exercise every means at its disposal to enact its policy objective." Breed worked for the subsequent 17 months to launch CleanPowerSF, often fighting with the Lee administration. In January 2015 Mayor Lee announced he would support a slightly revised version of CleanPowerSF, and the program proceeded toward launch. In the summer of 2015 the International Brotherhood of Electrical Workers Local Union 1245, which represents PG&E employees, submitted a ballot measure, Proposition G, that would have imposed restrictions on CleanPowerSF. Breed and former Supervisor John Avalos wrote a competing measure, Proposition H, that would have required PG&E to disclose its use of nuclear power among other things. Following negotiations between IBEW representative Hunter Stern and Breed, Avalos, and their staff, IBEW agreed to oppose their own proposition and support Breed's measure. It passed with 80% support. In 2016 Breed passed the strongest styrofoam ban in the country, banning almost all sales and uses of Styrofoam in San Francisco, including cups, egg cartons, coolers, and packing peanuts. The law made national and international news and a NowThis video about it reached 10 million views. In the final week of Breed's reelection campaign in 2016 she released a comical web video about the legislation called "Styrofoam Monster." In the ad, Breed chases away a bully who is dressed in a Styrofoam costume. The SF Chronicle said: "The award for most creative campaign ad goes to Board of Supervisors President London Breed..[It] is akin to an ingenious high school video production." In 2015 Breed passed legislation requiring drug manufacturers to fund a drug take-back program in San Francisco, enabling consumers to place unused medications in secure drop-off bins in pharmacies. Unused drugs are often disposed in the trash or toilet which can pollute waterways or lead to accidental poisonings. Breed published an oped in support of the legislation. It passed unanimously on March 17, 2015 making San Francisco only the third county in the nation to launch such a program. The program has collected well over 20 tons of medications. Despite her environmental record during her first term on the Board of Supervisors, the local chapter of the Sierra Club endorsed her opponent. This prompted Breed's then-Chief of Staff Conor Johnston to write a scathing article in the San Francisco Examiner accusing the local Sierra Club chapter of hypocrisy and "bewildering anti-environmentalism" for blocking new housing and engaging in "political tribalism." ^ Knight, Heather (June 13, 2018). "It's a really big deal that SF elected London Breed as mayor". San Francisco Chronicle. Retrieved June 13, 2018. ^ Melendez, Lyanne (July 11, 2018). "San Francisco welcomes new mayor London Breed, first African-American woman to hold position". abc7news.com. Retrieved August 27, 2018. ^ Ostler, Scott. "Big crowd at SF Civic Center sees London Breed sworn in as new mayor". SFChronicle.com. Retrieved August 27, 2018. ^ Fracassa, Dominic (July 11, 2018). "Big crowd at SF Civic Center sees London Breed sworn in as new mayor". San Francisco Chronicle. Retrieved July 11, 2018. ^ "California Birth Index, London N Breed, born 1974". California Birth Index. Retrieved December 13, 2017. ^ a b c "District 5 – Board of Supervisors". www.sfbos.org. Retrieved December 12, 2017. ^ "Powdered milk and moving vans: The fight for affordable housing". The San Francisco Examiner. Retrieved April 14, 2017. ^ a b Knight, Heather. "London Breed feels her life experience can guide the city: Raised on the rough side of San Francisco, she believes her bruised hometown can be made to shine once again". San Francisco Chronicle. Retrieved June 13, 2018. ^ "Meet London Breed, San Francisco's first black woman mayor". Newsweek. June 14, 2018. Retrieved September 24, 2018. ^ Nevius, C.W. (November 10, 2012). "London Breed is S.F. 's election shocker". San Francisco Chronicle. Retrieved September 19, 2013. ^ Lagos, Marisa (December 26, 2012). "London Breed's emphasis: kids' lives". San Francisco Chronicle. Retrieved January 8, 2013. ^ "Board of Supervisors, District 5". sfelections.org. Retrieved April 14, 2017. ^ "District 3: Peskin apparently heading back to board". SFGate. Retrieved April 14, 2017. ^ "Mandelman ousts incumbent Sheehy in SF's District Eight". SFChronicle.com. June 6, 2018. Retrieved September 24, 2018. ^ "London Breed elected president of S.F. Board of Supervisors". SFGate. Retrieved April 14, 2017. ^ "London Breed elected president of S.F. Board of Supervisors". Retrieved December 12, 2017. ^ "SF supervisors elect Katy Tang as interim president". SFGate. Retrieved April 14, 2017. ^ https://www.facebook.com/yanan.k.wang. "Ex-Calif. State Sen. Leland Yee, gun control champion, heading to prison for weapons trafficking". Washington Post. Retrieved September 24, 2018. ^ "Public officials named in new findings from FBI probe of 'Shrimp Boy' Chow". The San Francisco Examiner. Retrieved April 14, 2017. ^ "London Breed Formally Announces Re-Election Campaign For D5 Supervisor | Hoodline". Retrieved April 14, 2017. ^ "RCV Results Summary Report for Board of Supervisors, District 5". www.sfelections.org. Retrieved April 14, 2017. ^ "SFByTheNumbers: A Tale of Two Incumbents". thebaycitybeacon.com. Retrieved April 14, 2017. ^ "Breed re-elected as SF's Board of Supervisors president". The San Francisco Examiner. Retrieved April 14, 2017. ^ "Overview | Board of Supervisors". sfbos.org. Retrieved September 24, 2018. ^ "What Just Happened in San Francisco?". CityLab. Retrieved September 24, 2018. ^ "Left bounced Breed for Conway ties. Turns out he invested in Farrell's firm". SFChronicle.com. February 4, 2018. Retrieved September 24, 2018. ^ Fracassa, Dominic; Swan, Rachel (January 5, 2018). "London Breed says she's in the race for SF mayor". San Francisco Chronicle. Retrieved June 13, 2018. ^ "June 5, 2018 Election Results – Detailed Reports". San Francisco Department of Elections. ^ Name (required) (May 24, 2018). "Sources: Mark Leno To Concede In San Francisco Mayor's Race « CBS San Francisco". Sanfrancisco.cbslocal.com. Retrieved June 13, 2018. ^ Fracassa, Dominic (June 26, 2018). "SF supervisors elect Malia Cohen their president as Breed set to become mayor". San Francisco Chronicle. Retrieved June 26, 2018. ^ Fracassa, Dominic (July 11, 2018). "London Breed has short term as SF mayor to prove herself for re-election". San Francisco Chronicle. Retrieved July 11, 2018. ^ Melia Robinson (August 19, 2018). "San Francisco launches 'Poop Patrol' to clean human feces on sidewalks". Business Insider. Retrieved August 27, 2018. ^ Fracassa, Dominic. "SF Mayor Breed envisions adding 1,000 beds for the homeless by end of 2020". San Francisco Chronicle. ^ Fracassa, Dominic. "SF Mayor London Breed aims to cut red tape to help homeless faster". San Francisco Chronicle. ^ Fraccassa, Dominic. "S.F. working to double beds at crucial homeless facility". San Francisco Chronicle. ^ Thadani, Trisha. "SF mayor, supes differ on use of city's $181 million windfall: Let wrangling begin". San Francisco Chronicle. ^ CBS, CBS. "San Francisco Mayor Seeks More Homeless Housing Through Conservatorship Law". KPIX -- CBS. ^ "San Francisco Supervisor London Breed coming up with new plan to crack down on graffiti offenders". ABC7 San Francisco. Retrieved April 7, 2016. ^ "6-figure fine means it's a new day for taggers in S.F." San Francisco Chronicle. Retrieved April 7, 2016. ^ Inc., Granicus,. "City and County of San Francisco - File #: 141045". sfgov.legistar.com. Retrieved September 24, 2018. ^ "S.F. supervisor says Fire Department puts public safety at risk". SFGate. September 16, 2014. Retrieved September 24, 2018. ^ "SF Fire Department seeking more money for paramedics". The San Francisco Examiner. Retrieved September 24, 2018. ^ "Mayor Lee Proposes $47.3M Funding for SFFD, Emergency Services". sfappeal.com. Retrieved September 24, 2018. ^ FOX. "Who is Acting Mayor of San Francisco London Breed?". KTVU. Retrieved September 24, 2018. ^ "SF Civil Grand Jury" (PDF). ^ "San Francisco Firefighters Local 798". www.facebook.com. Retrieved September 24, 2018. ^ "San Francisco Mayor Lee Signs Budget Without Cuts, Money For 400 More Police Officers". July 29, 2015. Retrieved September 24, 2018. ^ "Mayor Lee & Board Announce Comprehensive Package of Public Safety Reforms | Office of the Mayor". sfmayor.org. Retrieved September 24, 2018. ^ Inc., Granicus,. "City and County of San Francisco - File #: 150628". sfgov.legistar.com. Retrieved September 24, 2018. ^ "Supervisor London Breed Calls for a Federal Investigation into the SFPD's Shooting Death of Mario Woods". SF Weekly. Retrieved April 7, 2016. ^ Inc., Granicus,. "City and County of San Francisco - File #: 160028". sfgov.legistar.com. Retrieved September 24, 2018. ^ Lee, Vic (October 12, 2016). "DOJ report cites bias by San Francisco police". ABC7 San Francisco. Retrieved September 24, 2018. ^ "SF supes unanimously turn down plan to build new jail". The San Francisco Examiner. Retrieved September 24, 2018. ^ Inc., Granicus,. "City and County of San Francisco - File #: 151286". sfgov.legistar.com. Retrieved September 24, 2018. ^ Inc., Granicus,. "City and County of San Francisco - File #: 160081". sfgov.legistar.com. Retrieved September 24, 2018. ^ Inc., Granicus,. "City and County of San Francisco - File #: 160586". sfgov.legistar.com. Retrieved September 24, 2018. ^ "San Francisco, California, Citizen Complaints Office Investigations of Police Shootings, Proposition D (June 2016) - Ballotpedia". Ballotpedia. Retrieved September 24, 2018. ^ "San Francisco, California, Police Oversight Amendment, Proposition G (November 2016) - Ballotpedia". Ballotpedia. Retrieved September 24, 2018. ^ Inc., Granicus,. "City and County of San Francisco - File #: 151275". sfgov.legistar.com. Retrieved September 24, 2018. ^ "SF Board Seeks to Curb Break-ins With New Rental Car Rules". NBC Bay Area. Retrieved September 24, 2018. ^ Inc., Granicus,. "City and County of San Francisco - File #: 161065". sfgov.legistar.com. Retrieved September 24, 2018. ^ a b Breed, London (January 30, 2018). "An Affordable City for ALL of Us". London Breed. Retrieved September 24, 2018. ^ "S.F. Supervisor Breed's plan: Put homeless in public housing". SFGate. April 15, 2014. Retrieved September 24, 2018. ^ Inc., Granicus,. "City and County of San Francisco - File #: 150622". sfgov.legistar.com. Retrieved September 24, 2018. ^ "Feds To Allow Preferences For Low-Income Applicants In S.F. Housing Complex". NPR.org. Retrieved September 24, 2018. ^ "HUD to rethink veto of SF's preference housing law". SFGate. September 2, 2016. Retrieved September 24, 2018. ^ "Federal Officials Approve Preferences at New Senior Housing Complex in S.F." KQED. September 23, 2016. Retrieved September 24, 2018. ^ "Mayor Lee and Board President London Breed Celebrate Opening of Willie B. Kennedy Apartments | Office of the Mayor". sfmayor.org. Retrieved September 24, 2018. ^ Inc., Granicus,. "City and County of San Francisco - File #: 150082". sfgov.legistar.com. Retrieved September 24, 2018. ^ "Homes not cars on Divisadero". The San Francisco Examiner. Retrieved September 24, 2018. ^ "London Breed Response Re Divis NCT 11-5-15 | Public Housing | San Francisco". Scribd. Retrieved September 24, 2018. ^ "Supervisor Breed Calls for Removing Some of SF's Parking Mandates". Streetsblog San Francisco. March 3, 2015. Retrieved September 24, 2018. ^ "City of San Francisco Housing Bond Issue, Proposition A (November 2015) - Ballotpedia". Ballotpedia. Retrieved September 24, 2018. ^ "San Francisco, California, Affordable Housing Bond Issue, Proposition C (November 2016) - Ballotpedia". Ballotpedia. Retrieved September 24, 2018. ^ "5 SF supervisors seek commercial property tax hike to pay for more housing". SFGate. January 17, 2018. Retrieved September 24, 2018. ^ Inc., Granicus,. "City and County of San Francisco - File #: 180075". sfgov.legistar.com. Retrieved September 24, 2018. ^ "Housing tax measure failing, while competing childcare measure remains too close to call". The San Francisco Examiner. Retrieved September 24, 2018. ^ "Right to attorney in evictions going before SF supervisors". SFChronicle.com. November 14, 2017. Retrieved September 24, 2018. ^ "San Francisco, California, Proposition F, City-Funded Legal Representation for Tenants Facing Eviction (June 2018) - Ballotpedia". Ballotpedia. Retrieved September 24, 2018. ^ "SF set to start process for building modular housing for formerly homeless". SFChronicle.com. January 23, 2018. Retrieved September 24, 2018. ^ "Endorsements - London Breed for Mayor of San Francisco". London Breed for Mayor of San Francisco. Retrieved September 24, 2018. ^ "Where London Breed stands on San Francisco's biggest issues". SFChronicle.com. June 14, 2018. Retrieved September 24, 2018. ^ "Mayoral Candidate Questionnaire - London Breed - YIMBY Action". yimbyaction.org. Retrieved September 24, 2018. ^ "Mayor London Breed: 'Yes, we will build more housing". Curbed SF. Retrieved September 24, 2018. ^ Inc., Granicus,. "City and County of San Francisco - File #: 130977". sfgov.legistar.com. Retrieved September 24, 2018. ^ Inc., Granicus,. "City and County of San Francisco - File #: 140882". sfgov.legistar.com. Retrieved September 24, 2018. ^ Inc., Granicus,. "City and County of San Francisco - File #: 141224". sfgov.legistar.com. Retrieved September 24, 2018. ^ Inc., Granicus,. "City and County of San Francisco - File #: 130713". sfgov.legistar.com. Retrieved September 24, 2018. ^ Inc., Granicus,. "City and County of San Francisco - File #: 150472". sfgov.legistar.com. Retrieved September 24, 2018. ^ "SFMTA Board Approves Contract for New Fleet of Muni Metro Trains". Streetsblog San Francisco. July 16, 2014. Retrieved September 24, 2018. ^ "Muni's new future fleet debuts on the factory floor". The San Francisco Examiner. Retrieved September 24, 2018. ^ fpadmin (January 13, 2017). "Your First New Muni Train is in San Francisco". SFMTA. Retrieved September 24, 2018. ^ "New Muni train, designed to be quieter and more spacious, hit San Francisco streets". SFGate. November 17, 2017. Retrieved September 24, 2018. ^ "Another Day, Another Driver Blocking Muni's Busiest Metro Line". Streetsblog San Francisco. May 11, 2015. Retrieved September 24, 2018. ^ fpadmin (September 7, 2016). "More Morning Trains Mean Commute Relief on the Inner N Judah". SFMTA. Retrieved September 24, 2018. ^ "New Shuttles Add Capacity To Busy N Judah Light-Rail Line". SFGate. September 7, 2016. Retrieved September 24, 2018. ^ "Plans and Programs Committee - September 17, 2013 | San Francisco County Transportation Authority". www.sfcta.org. Retrieved September 24, 2018. ^ "Muni to Test Seat Reconfiguration to Make More Room on Light-Rail Vehicles". Streetsblog San Francisco. September 19, 2013. Retrieved September 24, 2018. ^ fpadmin (December 5, 2014). "Survey Says!". SFMTA. Retrieved September 24, 2018. ^ "Regulators clear Muni's first metro train car in future fleet". The San Francisco Examiner. Retrieved September 24, 2018. ^ Inc., Granicus,. "City and County of San Francisco - File #: 161040". sfgov.legistar.com. Retrieved September 24, 2018. ^ a b "Cell service finally coming to Muni tunnels". The San Francisco Examiner. Retrieved September 24, 2018. ^ fpadmin (October 25, 2016). "SF Supervisors Approve Plan for Muni's Subway Cell Service". SFMTA. Retrieved September 24, 2018. ^ "Underground Muni Riders To Finally Be Blessed With Cell Phone Service". SFist. Retrieved September 24, 2018. ^ Inc., Granicus,. "City and County of San Francisco - File #: 140509". sfgov.legistar.com. Retrieved September 24, 2018. ^ "Proposition A: San Francisco Transportation and Road Improvement Bond - San Francisco County, CA". www.smartvoter.org. Retrieved September 24, 2018. ^ Inc., Granicus,. "City and County of San Francisco - File #: 140556". sfgov.legistar.com. Retrieved September 24, 2018. ^ "Proposition B: Adjusting Transportation Funding for Population Growth - San Francisco County, CA". www.smartvoter.org. Retrieved September 24, 2018. ^ "Wiener's Prop B Yields More Money Than Expected for Muni, Safe Streets". Streetsblog San Francisco. March 16, 2015. Retrieved September 24, 2018. ^ "Supervisor Breed's December Newsletter". myemail.constantcontact.com. Retrieved September 24, 2018. ^ Inc., Granicus,. "City and County of San Francisco - File #: 150790". sfgov.legistar.com. Retrieved September 24, 2018. ^ "INVEST: Transportation Sustainability Fee | Planning Department". sf-planning.org. Retrieved September 24, 2018. ^ "$48 Million Investment in Public Transportation System's Frontline Operations & Street Improvement Projects | Office of the Mayor". sfmayor.org. Retrieved September 24, 2018. ^ Inc., Granicus,. "City and County of San Francisco - File #: 151232". sfgov.legistar.com. Retrieved September 24, 2018. ^ fpadmin (May 13, 2013). "Van Ness Improvement Project". SFMTA. Retrieved September 24, 2018. ^ Inc., Granicus,. "City and County of San Francisco - File #: 170168". sfgov.legistar.com. Retrieved September 24, 2018. ^ "City of San Francisco Transportation and Road Improvement Bond, Proposition A (November 2014) - Ballotpedia". Ballotpedia. Retrieved September 24, 2018. ^ Breed, London (May 1, 2018). "Transportation that Works for Everyone". London Breed. Retrieved September 24, 2018. ^ Inc., Granicus,. "City and County of San Francisco - File #: 180134". sfgov.legistar.com. Retrieved September 24, 2018. ^ "Regional Measure 3 | Fund + Invest | Our Work | Metropolitan Transportation Commission". mtc.ca.gov. Retrieved September 24, 2018. ^ "Bike to Work Day at City Hall: Lots of Pro-Bike Talk, Few Real Commitments". Streetsblog San Francisco. May 10, 2013. Retrieved September 24, 2018. ^ "Breed, Preston Exchange Jabs, Present Policies In District 5 Candidate Forum | Hoodline". Retrieved September 24, 2018. ^ "2016 District 5 Candidate London Breed | San Francisco Bicycle Coalition". sfbike.org. Retrieved September 24, 2018. ^ "Masonic Avenue | San Francisco Bicycle Coalition". sfbike.org. Retrieved September 24, 2018. ^ "With ribbon cutting ceremony, Masonic corridor and plaza overhaul is complete". ABC7 San Francisco. August 14, 2018. Retrieved September 24, 2018. ^ "MAYOR LONDON BREED UNVEILS MASONIC AVENUE STREETSCAPE IMPROVEMENT PROJECT | Office of the Mayor". sfmayor.org. Retrieved September 24, 2018. ^ Inc., Granicus,. "City and County of San Francisco - File #: 140047". sfgov.legistar.com. Retrieved September 24, 2018. ^ Dailey, Keli (August 14, 2017). "Vision Zero SF". SFMTA. Retrieved September 24, 2018. ^ Inc., Granicus,. "City and County of San Francisco - File #: 160925". sfgov.legistar.com. Retrieved September 24, 2018. ^ "Transportation Demand Management FAQs | Planning Department". sf-planning.org. Retrieved September 24, 2018. ^ "Sup. Breed Backs Idaho's Common-Sense Law: Let Bikes Yield at Stop Signs". Streetsblog San Francisco. July 29, 2015. Retrieved September 24, 2018. ^ "Sign of the times: Cyclist group wants SF to update policy on when to stop". The San Francisco Examiner. Retrieved September 24, 2018. ^ Montgomery, Kevin. "This Is What Happened When Bicyclists Obeyed Traffic Laws Along The Wiggle Yesterday". SF Weekly. Retrieved September 24, 2018. ^ Inc., Granicus,. "City and County of San Francisco - File #: 151268". sfgov.legistar.com. Retrieved September 24, 2018. ^ Inc., Granicus,. "City and County of San Francisco - File #: 141266". sfgov.legistar.com. Retrieved September 24, 2018. ^ "S.F. tries to fire contractor over gas leaks in Haight project". SFChronicle.com. October 26, 2015. Retrieved September 24, 2018. ^ "Breed seeks answers for Haight gas leaks, sinkholes". The San Francisco Examiner. Retrieved September 24, 2018. ^ Inc., Granicus,. "City and County of San Francisco - File #: 151110". sfgov.legistar.com. Retrieved September 24, 2018. ^ Inc., Granicus,. "City and County of San Francisco - File #: 160225". sfgov.legistar.com. Retrieved September 24, 2018. ^ "SF Bicycle Coalition Endorsements: Nov. 8, 2016 | San Francisco Bicycle Coalition". sfbike.org. Retrieved September 24, 2018. ^ a b "London Breed elected president of S.F. Board of Supervisors". SFGate. January 9, 2015. Retrieved September 24, 2018. ^ "Climate Action Strategy" (PDF). ^ "June 2018 Mayoral Endorsement: #1 Mark Leno #2 Jane Kim #3 London Breed". San Francisco League of Conservation Voters. Retrieved September 24, 2018. ^ "American Legal Publishing - Online Library". library.amlegal.com. Retrieved September 24, 2018. ^ Sabatini, Joshua. "San Francisco supervisors decry feet-dragging on CleanPowerSF rates". The San Francisco Examiner. Retrieved September 24, 2018. ^ "Mayor Lee proposes gutting CleanPowerSF energy program". SFGate. April 30, 2014. Retrieved September 25, 2018. ^ Roberts, Chris. "Mayor, board president signal CleanPowerSF support". The San Francisco Examiner. Retrieved September 25, 2018. ^ "City of San Francisco "Disclosures Regarding Renewable Energy" Initiative, Proposition G (November 2015) - Ballotpedia". Ballotpedia. Retrieved September 25, 2018. ^ "City of San Francisco Referred Measure Defining "Clean, Green and Renewable Energy," Proposition H (November 2015) - Ballotpedia". Ballotpedia. Retrieved September 25, 2018. ^ "Behind Props. G and H, Dueling S.F. 'Green' Energy Ballot Measures". KQED. November 2, 2015. Retrieved September 25, 2018. ^ "San Francisco Styrofoam Ban Said to Be Nation's Strictest". NBC4 Washington. Retrieved September 25, 2018. ^ Inc., Granicus,. "City and County of San Francisco - File #: 160383". sfgov.legistar.com. Retrieved September 25, 2018. ^ "Foam fight: SF plan would ban Styrofoam". SFChronicle.com. April 19, 2016. Retrieved September 25, 2018. ^ Ruiz-Grossman, Sarah (June 30, 2016). "San Francisco Just Issued The Country's Broadest Ban On Styrofoam". Huffington Post. Retrieved September 25, 2018. ^ "San Francisco just passed the nation's toughest ban on Styrofoam". Mother Jones. Retrieved September 25, 2018. ^ Poston, Ben. "San Francisco enacts extensive ban on all things foam - Los Angeles Times". latimes.com. Retrieved September 25, 2018. ^ Press, Associated (July 9, 2016). "San Francisco introduces extensive polystyrene ban". The Telegraph. ISSN 0307-1235. Retrieved September 25, 2018. ^ "NowThis". www.facebook.com. Retrieved September 25, 2018. ^ "'Styrofoam monster' no match for London Breed". SFChronicle.com. November 4, 2016. Retrieved September 25, 2018. ^ Inc., Granicus,. "City and County of San Francisco - File #: 141095". sfgov.legistar.com. Retrieved September 25, 2018. ^ "S.F. supes weigh expanding safe drug disposal program". SFGate. March 9, 2015. Retrieved September 25, 2018. ^ Breed, London. "Creating safe medicine disposal options". The San Francisco Examiner. Retrieved September 25, 2018. ^ Sabatini, Joshua. "San Francisco may require drug companies to dispose of unwanted drugs". The San Francisco Examiner. Retrieved September 25, 2018. ^ Silverman, Ed (February 27, 2015). "That Flushing Sound: San Francisco Moves Closer to a Take-Back Program". WSJ. Retrieved September 25, 2018. ^ "Keeping Drugs Out of Our Waterways: Safe Drug Disposal Program". Clean Water Action. February 9, 2016. Retrieved September 25, 2018. ^ "November 2016 Endorsements". Sierra Club. August 8, 2016. Retrieved September 25, 2018. ^ "SF Sierra Club puts politics over the planet". The San Francisco Examiner. Retrieved September 25, 2018. 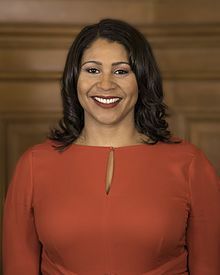 Wikimedia Commons has media related to London Breed.